Moth Orchid Care is Easy! Moth Orchid Care, Learn How Easy It Is! Are you interested in learning about Moth Orchid Care? These are what I consider as an easy to grow orchid. Moth Orchids, more formally known as Phalaenopsis Orchids are just that, an easy to grow orchid. They are easy orchids for growing orchids for beginners. And yet, they are beautiful enough and elegant enough that many experienced growers (including me!) love to grow them. And it does not hurt that the flowers can sometimes last up to 3 or more months. the Phalaenopsis orchids. 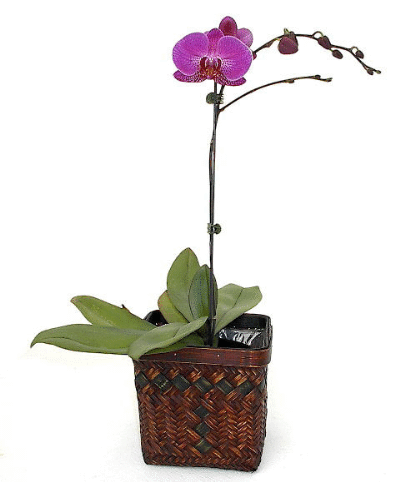 Phalaenopsis or moth orchids are some of the easiest orchids to care for in a home. And in some of the more temperate environments they can be grown outside in gardens and on trees. The are a very popular orchid and have been hybridized a lot resulting in some very colorful and interesting blossoms. Like other orchids, Phalaenopsis orchids (Moth Orchid Care)require appropriate light, water, temperature, fertilizer and humidity. The best light is indirect light. It can be bright but should not be direct sunlight. If you have a west facing window sill this will do just fine. Direct sun for very long can damage the leaves of the moth orchid. Light is very important for orchid care. Humidity is needed for the most orchids. Some actually grow in the wild in humid rain forests. In the warm months it would be nice to mist them every day or two. They also enjoy a bright bathroom. If humidity is a problem for your moth orchid care consider a humidity tray. Let's look at the temperatures for Moth Orchid Care. They prefer to grow in an environment similar to where they are found in nature and where they thrive. They are considered an intermediate temperature orchid. This means they like temperatures from 55 (13 C.)to 75 or 80 F.degrees (24 to 27 C.). It is important in the care of Phalaenopsisin order to encourage them to initiate a flower spike for there to be a temperature gradient of 10 to 15 degrees for at least 14 days in the fall. This helps stimulate growth of the flower spike. Moth orchids have no pseudobulbs to store water and for this reason they should not completely dry out. It is fine line to let them nearly dry out and at this point water them. You should be able to tell by seeing how light the weight of the plant and pot is before you water it. Another way is stick your finger tip (or a wooden pencil) down about an inch into the plant and it should feel almost dry. It is at this point you should water. Let the water run through the plant (in the top and out the bottom) for about 30 seconds. It is important that any orchid plant root does not sit in water because it will get root rot.Phalaenopsos orchids are somewhat prone to root rot.It is also important not to let water stay in the crown of the plant for a long time. They are also proneto crown rot. You can avoid this by watering early in the day. Or you can use a paper towel or cotton swab to absorb the water. Fertilize the plant twice a month with a weak fertilizer solution. It is recommended to cut amount of fertilizer recommended by one half or one quarter. Fertilize about every other week with a balanced fertilizer (20-20-20)except durng the summer months of growth when you can use a high nitrogen fertilizer (30-10-10). The Phalaenopsis orchid is really pretty easy to grow and this is an easy group to start with for the beginning orchid grower. I encourage you to try these lovely orchids. They are elegant and graceful plants whose flowers can last up to 3 months. So now you have a good understand of basic moth orchid care.